1,399 people read this post. The Zionist world has been up in arms after UNESCO, on October 13, passed a resolution thoroughly condemning a range of Israeli violations at Masjid al Aqsa. Zionist mouthpieces have been swift in castigating the resolution as a denial of Jewish history and the Israeli government has, in its wake, suspended what were its already tenuous ties with the UN body. In reality, however, a reading of its text reveals that the resolution in fact made no official pronouncement on Jewish ties – or the lack thereof, to Masjid al Aqsa. To the contrary, after recalling a series of international conventions and protocols relevant to Masjid al Aqsa, the resolution, at its outset, actually affirms the “importance of the Old City of Jerusalem and its Walls for [all] the three monotheistic religions”. In then proceeds to decry failures by Israel to abide by previous UNESCO resolutions, before censuring the Zionist state for a range of belligerent measures adopted against Masjid al Aqsa, its worshippers, buildings and administration – with no mention of the history of the site throughout. The charge then that the resolution seeks to erase Jewish history has no explicit basis. Zionists have ostensibly magnified this resolution for political gain or to entrench a narrative of perpetual victimhood. Nonetheless, what has appeared to have irked the Zionists most about the motion’s wording has been its referral to the Holy Site exclusively using Arabic Islamic names such as Al-Aqsa Mosque, Al-Haram Al-Sharif, Mughrabi Ascent and Al-Buraq Plaza. Some Zionists may conceive of this choice of wording to constitute sufficient grounds to fit their conclusions. However, all that the UNESCO resolution actually does through this phrasing is simply affirm a long standing status quo, and an accepted understanding of the status of Masjid al Aqsa in Jerusalem. Its basis in contemporary modern history can be found in the Ottoman status quo arrangement for Jerusalem that was introduced in a Firman (an administrative order or decree issued by an Ottoman Turkish Sultan) in 1852. This froze claims of possession by religious communities in the Holy Places of Christendom and forbade any construction or alterations to holy places. The introduction of the arrangement represented a futile attempt by Ottoman Sultan Abdul Majid to avoid a war between the Greek Orthodox and Catholic churches over space and control of some areas in the Holy Sepulchre Church in Jerusalem and the Nativity Church in Bethlehem. Article 62 of the Treaty of Berlin (1878) however subsequently proclaimed the 1852 decree to be inviolable and declared it the ‘Status Quo of the Holy Places,’ extending it to other, non-Christian holy sites. The successive governments of Palestine, the British Mandate and Jordan, all maintained the regulations set forth in this agreement. Following violent clashes in August 1929 prompted by more Zionist provocation at what they deemed the ‘Wailing Wall’, the subsequent British Inquiry Commission convened in December 1930 confirmed that although Jews may have free access to the Wall for prayers, “the ownership of the Wall, as well as the possession of it and of those parts of its surroundings belong to the Muslims and that the Wall itself, as an integral part of Al-Haram Ash- Sharif area, is Muslim property”. Upon the onset of its Occupation in 1967, despite showing an inclination to fully annex Masjid al Aqsa, pragmatism won the day in Israel, and Moshe Dayan communicated with directors of the Islamic Waqf agreeing to respect the status quo, accepting Muslim day-to-day administration of the Haram Ash-Sharif, whilst allowing non-Muslims to visit it the site(but not to pray in it). Even at this stage, however, there were mixed signals, as Dayan simultaneously proclaimed full authority over the Western/Al-Buraq Wall and plaza. From a Jewish religious point of view too, there was no enthusiasm in Israel to immediately appropriate Masjid al Aqsa. A message broadcast by the Chief Rabbis of Israel – Isser Yehuda Unterman and Yitzhak Nissim – warned that Jews were not permitted to enter the holy site. This was reiterated a few days later by the Chief Rabbinate, which ordered the placement of signs to this effect at the gates leading to the Haram Ash-Sharif. From a theological point of view, the reasoning was that Jews might accidentally step on – and thereby desecrate due to their impurity – the place where the so-called ‘Holy of Holies once stood. This 1967 rabbinical ban on entering any part of Masjid al Aqsa has repeatedly been confirmed, most recently: in January 2005 by leading rabbis, in 2013 by the Chief Rabbis David Lau and Yitzhak Yosef, and in November 2014 by Sephardic Chief Rabbi Yitzhak Yosef, who called non-compliance with the ban a “religious crime”. For its part, the international community has not recognized Israel’s annexation of East Jerusalem, of which Masjid al Aqsa forms part. Successive UNESCO resolutions have also sought to enforce the status quo outlined above – again highlighting a consistent understanding of the dynamics of custodianship at Masjid al Aqsa. In 1968, UNESCO strongly condemned Israeli excavations in the Old City and any attempts to alter its “cultural and historical character, particularly with regard to Christian and Islamic religious sites.” During subsequent years UNESCO repeatedly condemned Israel’s non-compliance with its legal provisions, which continued in the wake of the Old City of Jerusalem and its walls being added to the UNESCO World Heritage List in 1981 (as proposed by Jordan a year earlier) and named a World Heritage Site in Danger in 1982, and even after Israel’s acceptance of the World Heritage Convention in 1999. Underscoring Zionist arguments in the wake of this resolution are a number of misapprehensions regarding the Muslim link to Masjid al Aqsa. First, Muslim Nations are being chided for referring to the entire sacred precinct in Jerusalem as Masjid al Aqsa, when Masjid al Aqsa is supposedly only the black domed structure at the forefront of the compound. Secondly, the naysayers are finding it inconceivable for Muslims to profess a deep link with the site when the Muslim connection purportedly only begins with the Prophet Muhammad SAW’s miraculous night journey to Masjid al Aqsa one year prior to Hijrah and with the formalisation of this presence 16 years later during the Muslim conquest of Jerusalem(636/7 CE). Addressing these two notions are imperative, for the world to truly appreciate the Muslim yearning for Jerusalem. Regarding what constitutes Masjid al Aqsa, it is the unanimity of Muslim scholars that Masjid al Aqsa is all that resides within the walled off compound known as the Haram al Sharif in Jerusalem. Masjid al Aqsa is not restricted to structures such as the black-domed Qibli mosque, or the golden domed Dome of the Rock mosque. Rather it is the land of the entire area that Islam considers holy and not just the bricks and mortar. Likewise, for Muslims, Islam is not considered a new religion that began in the 600s when the Prophet Muhammad SAW began preaching in Makkah. Instead, it is seen as a continuation and capstone of the traditions of earlier prophets that are revered by all three monotheistic faiths. The message of Muhammad SAW only continues and perfects the messages of Ibrahim (Abraham), Musa (Moses), and ‘Isa, which had been corrupted over time. Thus, for Muslims, the ‘Temple’ that was built by Prophet’s Dawood and Sulayman(David and Solomon) AS on the ‘Temple Mount’ in ancient times is in fact part of our own religious history. With this mindset, when Muslims conquered the city of Jerusalem in 637 during the caliphate of ‘Umar ibn al-Khattab, they sought to resurrect Jerusalem as a place of worship. The ancient home of worship of Jerusalem had been rebuilt numerous times, most recently by Herod around 20 BC. By 70CE, however, the Romans destroyed it after a Jewish revolt in Palestine. Jews were forbidden from entering the city and Judaism all but died in Jerusalem. The area where this house of worship stood remained as a wasteland for the next few hundred years. The Romans used the area as a garbage dump, so when ‘Umar entered the city and went to see where his religious forefathers such as Dawud and Sulayman had worshiped (which was also the place where Muhammad SAW along with all the Prophets had worshiped during the Isra’ wal-Mi’raj) he found the area filthy and unusable as a mosque. Nevertheless, he decided to clean the area and build a Masjid upon the site. As was his custom, he worked alongside average Muslims in cleaning and purifying the area. They erected a basic mosque that could fit about 3000 people at the southern end of the compound, now known by the Muslims as the Haram al-Sharif, the Noble Sanctuary. Islam, as portrayed most distinctly during the Isra and Mi’raj, is an inclusive way of life – bringing all the Prophets of Allah SWT together, not segregating or differentiating between them. The Islamic historical significance of Masjid al Aqsa dates back further than that suggested by many Jews and Christians. 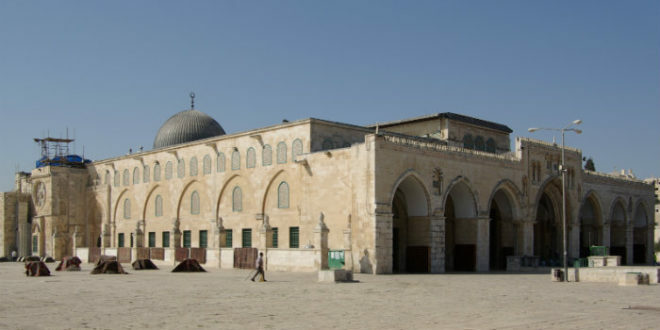 For adherents of the Islamic faith Masjid al Aqsa was the second place of worship to be established on earth, which was subsequently rebuilt across the ages by numerous Prophets of Allah SWT including Sayyidina Ibrahim, Ishaaq, Dawood and Sulaymaan AS. The importance of al Quds to many Jews and Christians begins only with the Prophet Ibrahim and is reinforced by the rebuilding of Masjid al Aqsa by Dawud and Sulayman AS generations later. To Muslims, however, Dawud and Sulayman AS are but two of the many Prophets in the chain of Prophethood associated with this blessed site. Muslims believe in them and all other Prophets of Allah and acknowledge all of their associations with the Holy Site. It is for this reason that it has been argued – that of all the adherents of the Abrahamic faiths – Muslims are best suited for the custodianship of this abode rich in spiritual heritage. “[They are the] only people who recognize all of the three monotheistic religions – Judaism, Christianity and Islam – as being based on a truly divine revelation; the people who revere all the Prophets of these three religions, the people who, by virtue of their own religious doctrine, are prohibited from and therefore utterly averse to reviling anything that is sacred to the two other faiths: only such people can be counted upon to safeguard the three-sided character of Jerusalem”. The paranoia that has characterized some responses to the UNESCO resolution is indicative of the great sensitivity of the status quo in Jerusalem, and how perceptions regarding intentions in the long-standing conflict are often shaped at the expense of fact. What Zionists and their supporters have to appreciate is that Palestinians will view all Israeli actions at Masjid al Aqsa through the prism of that ‘elephant in the room’: the ongoing occupation that discriminates against and subjugates the entire Palestinian population, and not only in Jerusalem. As one recent analysis put it: “In the Holy Land, prayer is not just an act of personal devotion: it implies ownership.” Palestinians, says the Palestinian Academic Society for the Study of International Affairs, see the wider picture aimed at erasing their presence and heritage in the city – already evident in the neglect of Palestinian neighbourhoods and historical narrative; the “Hebrewization” of Arab street names; destruction of homes; rampant settlement expansion and settler takeovers of buildings; the military presence; routine prevention of worshippers from entering the mosque due to bans and access restrictions; and harassment from Israeli authorities, including tax and arrest raids and imposition of fines, and ID card confiscations. Furthermore, the increasing number of police-escorted visits to Al-Aqsa Mosque compound by messianic settlers in recent years, supported by prominent figures in the Israeli government, are seen as a strategic government-backed step to breach the status quo and gradually impose the settler and far-right agenda, pre-empting a potential independent Palestinian state with East Jerusalem as its capital. Having lost so much at the hands of the Occupation over the years, Palestinians are ever wary that a similarly sordid fate should not eclipse Jerusalem and Masjid al Aqsa – two very powerful national and religious symbols – in totality. It is for this reason that they have become increasingly assertive in their defence of Masjid al Aqsa and have opted for, in their descriptions of the city, a vocabulary rich in Arabic and Islamic purport. This, by no means, should be interpreted as an attempt to divorce Jerusalem from its multi-faceted religious heritage. Just like Muslims, Christians and their sacred spaces in the Holy City are facing similar existential threats from the same malignant Israeli Occupation. It is this regime that should be loathed and brought to book for its perpetual project of eroding religious freedom in Jerusalem, rather than entertaining unsubstantiated fears of the spectre of some Muslim takeover of the city. The non-inclusivity and toxicity of Israeli Occupation is today manifest through a reign of fear that envelops Jerusalem – this juxtaposed with a Muslim legacy in the city that exudes inclusivity and glorious development. The legendary treaty of Jerusalem drafted by the Caliph Umar RA on his conquest in 637 – and upheld by all subsequent Muslim rulers of the city – is one glorious manifestation of this inclusive legacy, and a standard that succeeded in equitably regulating interfaith relations in Jerusalem for centuries. Even today, as recriminations over the latest UNESCO resolution and contesting religious claims abound, it is evident that the Treaty and wider Muslim legacy of leadership in the city have much to offer in showing the way to harmonious living in Jerusalem – The home of holiness.